The Blues advanced to the Champions League last 16 despite the 1-0 loss at St Jakob Park as the Swiss side did the double over the 2012 European champions courtesy of Mohamed Salah's 87th-minute strike. Chelsea now play their final Group E contest with Steaua Bucharest, whose draw with Schalke ensured the Blues' progress, on December 11 bidding to confirm top spot in the standings. Mourinho said: "I'm disappointed, not upset with the players. I understand. "The only positive thing is that we go through, but we don't go through because we got the result, we go through because Schalke didn't get the result. That, for me, is not the same. "In the end we qualified, which is the first objective, and now we have the last match at home to get the result to finish first. "Today I want to praise Basle. They won because we were sleeping in the last minutes, but they won also because they were the best team and they deserved to win." Chelsea, who failed to muster a meaningful shot during the 90 minutes, were "sleeping" because they were tired, according to Mourinho. He added: "If they weren't sleeping, how could that ball go in? When you are tired you sleep. When you are tired you think slow. When you are tired you react late. "We had in the last 20, 25 minutes situations in Basle's box where even there we thought slow, we react slow. We had situations to score, bad control, not the immediate shot, no sharpness. The team was tired. "So when the team was tired it can happen that you make defensive mistakes, the attacking mistakes, the goal that normally never goes in. "It was a bonus for Basle and Basle deserve the bonus." It was a performance far removed from the display in the 3-0 win at West Ham on Saturday. "Maybe I should've made more changes from the game on Saturday," the Portuguese added. "When the players play so well it's a big temptation to keep the team, keep the players, give them more confidence. (But) I could see many signs of fatigue." Only Willian, the solitary change from the Upton Park clash, was not fatigued according to the Blues boss. Mourinho added: "He didn't play a fantastic match, but Willian was different to the others. He was sharper, he was faster, he was pressing, he was running. "We had players that were not there. They weren't there because they were tired." Mourinho had hoped for a victory which would have rendered the result in the Steaua match irrelevant, giving the Blues eight, rather than nine, competitive fixtures in December. With that scenario failing to materialise, he must carefully consider how best to utilise his squad beginning with Sunday's home Premier League clash with Southampton. 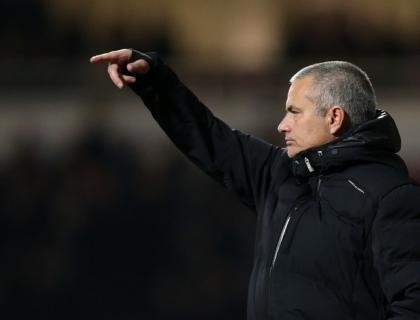 Mourinho added: "It's not a question of punishment, it's a question of using the squad and the options we have and to make changes when we have so many consecutive matches." Chelsea striker Samuel Eto'o was taken off on a stretcher in the first half and faces a scan to determine the full extent of his leg injury. Basle, who lost to Chelsea in last season's Europa League semi-finals, inflicted Chelsea's first group-stage loss at home in nearly 10 years in September, ending a 29-match unbeaten streak. And Basle boss Murat Yakin celebrated another memorable result as his side overtook Schalke ahead of their final match with the Germans which will decide who qualifies along with Chelsea. "To win twice against a team like Chelsea is something extraordinary," Yakin said. "Luck was on our side and we fought our way through to win the three points. "We wanted this final match against Schalke. We overtook them in the table, which is nice, but it doesn't make it necessarily easier. "We have the power to do this. The team is growing. We will try to qualify for the Champions League knockout stages." Yakin took special delight in beating Mourinho. He added: "Not many have achieved that, to win twice against him. It's nice and he congratulated me twice."